George Santayana famously said that "those who cannot remember the past are condemned to repeat it" (in The Life of Reason, Vol. I: Reason in Common Sense). The question, of course, is which past are we supposed to remember, immediate, middle distance, ancient? And what are we to do with our memories? This show was born in response to the media craziness during the months immediately before the Gore-Bush election, in the chaotic weeks that followed election day, and in the period since then, a craziness born, at least in part, by a collective amnesia; the pasts I choose to remember are those imaged in five great series of prints. 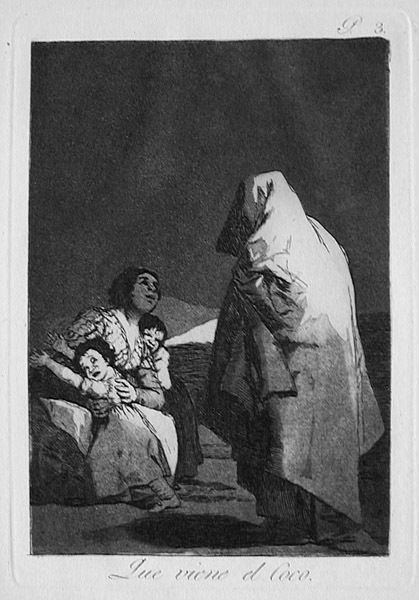 The eighty etchings that make up Goya’s most important series of prints, Los Caprichos (1799), have long been recognized as one of the supreme monuments of European art. Goya, royal painter to the kings of Spain during the late eighteenth-early nineteenth centuries, eventually died in exile, both of his major print series having been "donated" to the crown to protect him from the Inquisition. A believer in the potential power of reason, his works show what happens when reason is trampled underfoot by individual human follies and corrupt social customs. In these works Goya looks at his country and memorializes it as a monument to desperation, folly, arrogance, incompetence, and the need that some of his subjects have to try to control the uncontrollable. Spaightwood has a complete set (from the sixth editionan edition we first saw presented in an exhibit of Goya’s works at the Gutenberg Museum in Mainz, Germany); we will show the entire series of 80 plus several impressions from the Disasters of War and one of the Proverbios. 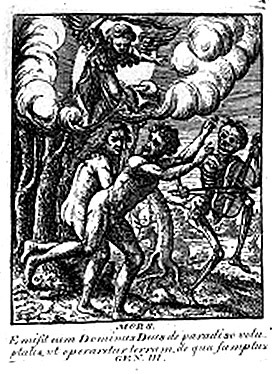 Shortly before Goya began work on the Caprichos, David Deuchar, a Scots artist, published a number of etchings based upon Hans Holbein’s early 16th-century series of woodcuts on the theme of the Dance of Death. Holbein, working shortly after the Reformation had thrown all Europe into chaos, was a congenial inspiration to Deuchar, working shortly after the American revolution had forced the world’s greatest military power, England, to abandon the colonies it had recently fought a war to keep safe from the French. It was a war that may have contributed to the dissolution of the French Monarchy, itself shortly to experience revolution and an outbreak of terror, pushing all Europe into a series of wars that led to a revival of French power under Napoleon and then its destruction at the battle of Waterloo at the hands of the British Army and supported by the British Navy. 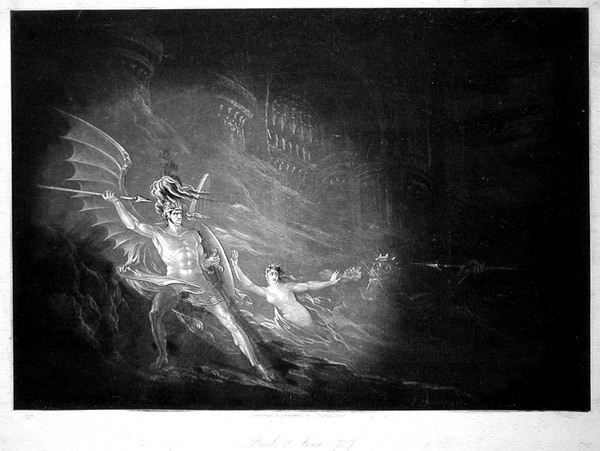 If the revolutionary William Blake had thought that Satan was the hero of Milton’s Paradise Lost and that Milton "was of the Devil’s party," John Martin, writing after Waterloo, has no such illusions: his mezzotints for an edition of Paradise Lost depict a war between light and darkness, and leave us always with the memory of the light shining in the darkness that cannot extinguish it. Rounding out the show will be selections from two early 20th-century masterpieces, selections from the Miserere by Georges Rouault and Marc Chagall's Dead Souls. 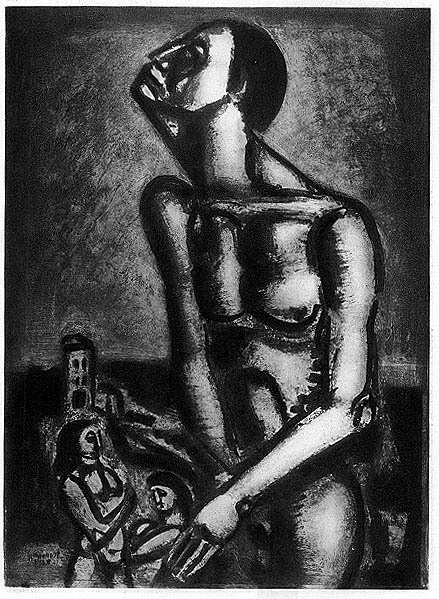 Rouault's works were inspired by the devastation caused by the First World War (one of the etchings takes its title from a line in Lucan’s Pharsalia describing the effects of the Roman Civil Wars, "Even the ruins are ruined") and the corruption of the society that had produced the Dreyfuss affair and seemed to many to have made France ready for another revolution. 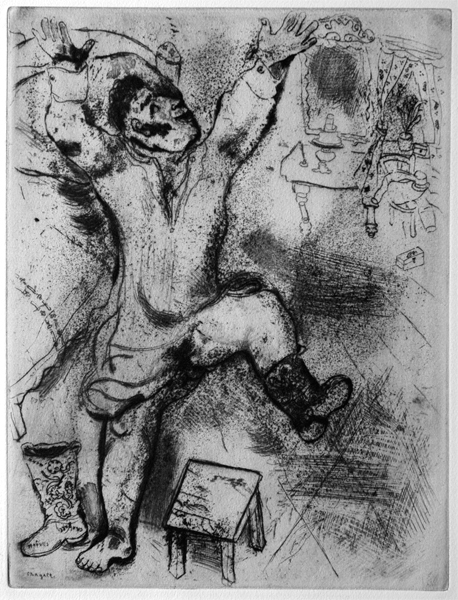 The Dead Souls etchings are Chagall's farewell to the Russia of the Czar and his nobles and the Russia of the Bolcheviks. 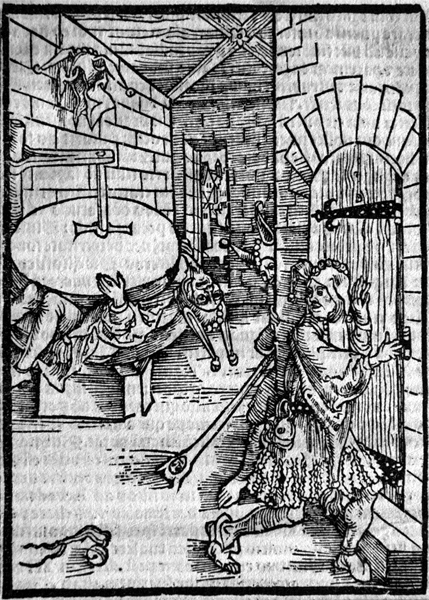 His targets appear to treated more in loving laughter than in anger, but the picture of a country ruled by credulous and rapacious land-owners and officious petty beaurocrates is nonetheless not a happy one: we are reminded once again of Benedick's final judgment ofo his society at the end of Shakespeare's Much Ado About Nothing: "Man is a giddy thing, and this is my conclusion." Francisco Goya y Lucientes (Spanish, 1746-1828), Here comes the bogey man (D. 40, Harris 38). Original etching and aquatint, c. 1798. Very good impression from the sixth edition (230 impressions). There were about 610 impressions in the first five editions. 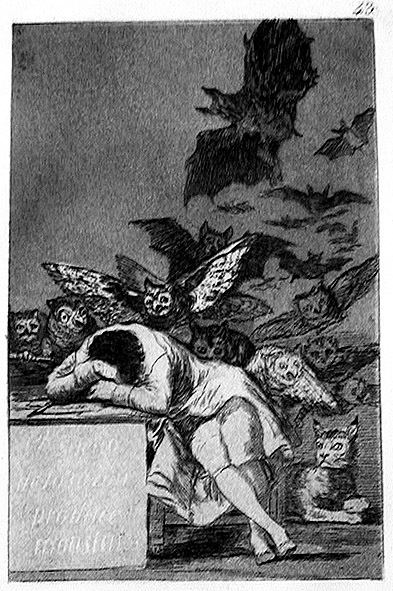 An early commentator (possibly Goya himself) comments on "the lamentable state of early education" and condemns those who would "cause a child to fear ... something that does not exist." Image size: 215x150mm. Price: $1600. Adam and Eve expelled from Paradise as Death begins the dance. Adam and Eve following God's punishment as Death lends a helping hand. 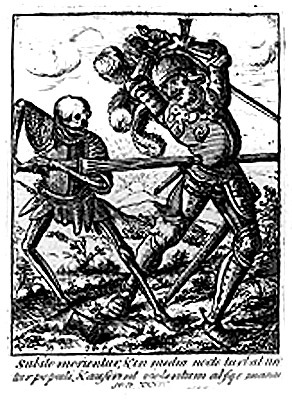 Death shows a Knight who is the better killer. 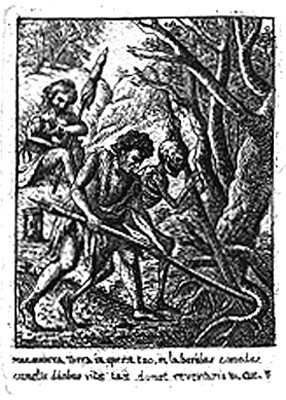 David Deuchar (Scots, active 1771-1803), Original etchings, c. 1786, after Hans Holbein's woodcuts for The Dance of Death. There is scattered foxing on almost all of these prints. Image size: 76x57mm. Price: $175 each. The actual etchings are much sharper than these scans. Satan, Sin, and Death. Original mezzotint, 1823-1825. Our impression is from one of the 50 sets marked "PROOF" assembled for the first edition (1827) of the Imperial Octavo edition of John Milton's Paradise Lost. Image size: 140x200mm. Price: SOLD. "Who puts himself between two stones, /And twisting words with glee condones, /Will soon earn ills and moans." 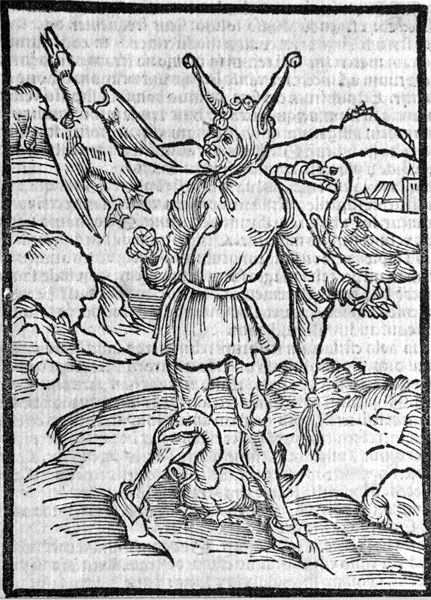 "Some think their wit is very fine, / Yet they were geese right down the line, All reason, breeding they decline." Ne sommes-nous pas forçats? / Are we not all convicts? (C&R 19d) Original aquatint, drypoint, burnisher, roulette, 1926. 450 impressions for the Miserere. Ours is a beautiful impression in excellent condition. There are no pencil-signed proofs. One of the greatest prints of the 20th-century. Rouault and Chagall are generally acclaimed as the two most important religious artists of the 20th century. Image size: 590x435mm. Price: $5500. Tchitchikov triumphant. (Sorlier 49, Hannover 95). Original etching, 1923-27. 335 impressions signed in the plate + 33 HC. Illustrated in Jean Adhemar's Twentieth-Century Prints (one of only three Chagall's included) and in the 1988 Moscow Chagall Exhibition. No hand-signed proofs exist. Included in the 1970 exhibit of Chagall's graphics at the Bibliotheque Nationale and Wesfalen 1985; illustrated in Meyer, Chagall: His Graphic Works. This is one of three Chagall prints illustrated in Jean Adhemar's Twentieth-Century Graphics (1971). Adhemar was then Curator of Prints at the Bibliothèque National in Paris and one of the foremost experts on prints. Image size: 276x210mm. Price: $6500.